Gogo Quinoa is a company that makes all kinds of quinoa products. For those of you who do not know about this trendy food, it is a whole grain that contains all of the essential amino acids making it a complete protein. Rice, for example does not have all of the essential amino acids which is why you may hear to eat it with beans to make it a complete meal. Quinoa is also great because it is gluten-free making it a good option for those who have Celiac disease or gluten intolerance. I was sent some of the quinoa cocoa, quinoa burgers, 4 grains hot cereal and crunchy muesli to review. I want to be honest with you and say that in the past, I have not really enjoyed quinoa. I think that taste is fine as it is quite mild but I had not liked the gritty texture. The first product that I tried was the quinoa cocoa. It contains puffed quinoa balls and is only 108 calories per half cup serving. I enjoyed this with a chopped frozen banana and skim milk. It made a tasty breakfast. This cereal does have a nutty flavor that is different than most cereals. With the addition of the banana, I really liked it. One serving has 1 gram of fiber and 1.8 grams of protein which is not a lot. I really ended up liking the 4 grain hot cereal. It is 190 calories, 7 grams of protein and 3 grams of fiber per 1/3 cup dry serving. 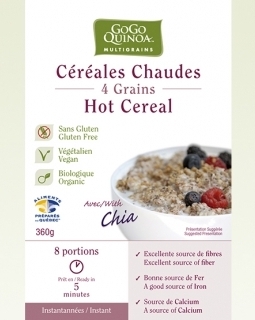 This cereal contains quinoa, amaranth, buckwheat and chia. This also had a nutty flavor and tasted good cooked in water and topped with peanut butter. It was more filling than oatmeal to me because it had more protein. This was a nice change for traditional oatmeal or cream of wheat. 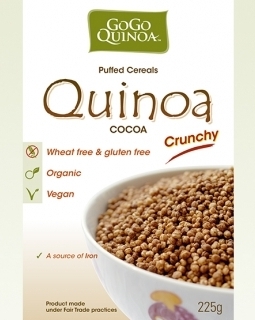 For all different types of products made with quinoa, check out Gogo Quinoa. Disclosure: I received these products for free to try from Gogo Quinoa. All opinions are my own. I like their muesli, but the quinoa cocoa looks good, too!